Alexa is all purple passion, with blue Iris and mixed purple and white Eustoma blooms. These rich colours are sure to delight and impress both men and women, and are appropriate for all occasions. 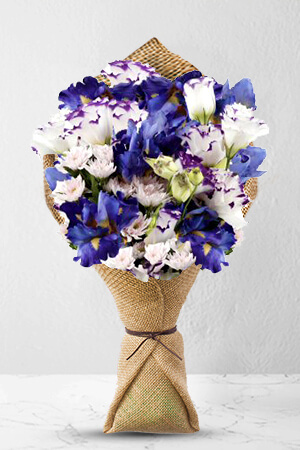 Send this joyful arrangement today.Vase not included. We would however suggest including a Premium Vase with your gift to make Alexis that extra boost of passion. Hassle free speedy service. Couldn't be happier with the service and will use again! We asked for a special colours for the special opening of a restauranton the other side of Australia, and had great service, along with a quick phone call to verify a change due to unavailability of certain glowers and to ascertain the best time slot for delivery. I decided to send some flowers to my daughters workplace for her birthday. Got online and within only a few clicks I had placed my order, received a prompt email to acknowledge receipt of my order and then was surprised to receive a final email to say my daughter had received the flowers ( which she says are just beautiful). Awesome service and communication - thanks very much !